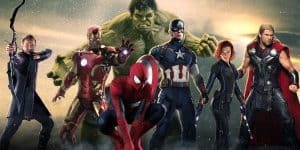 Spider-Man Confirmed for Role in Avengers: Infinity War | Nerd Much? After Tom Holland’s short but very enjoyable role in Captain America: Civil War, the actor has finally confirmed he will appear again as Spider-Man in Avengers: Infinity War. According to his Twitter, “in this interview for Vogue, Tom confirm his participation in the Avengers: Infinity War.” Despite the role being previously “up in the air” and the already confirmed Spider-Man: Homecoming sequel to keep Holland busy, it seems he’ll be a part of the Avengers team once again. Infinity Wars promises to be quite the movie, as we finally get to see our favorite band of misfits (the Guardians of the Galaxy) assemble with the Avengers to take on Thanos. The film is set to come out in 2018 so it’s a little too soon to be sure as to the extent of Holland’s role in the film. I certainly hope to see more of him than I did in Civil War, as he’s my favorite film depiction of the character after the original cartoon. What kind of role are you hoping Spider-Man will play in Avengers: Infinity War? Would you like to him to have a more significant part? Share your thoughts in the comments below!